Greatest Building Designers in the United States. designed by Fazlur Rahman Khan.  For a general guide, see: History of Architecture (3,000 BCE - present).  For a world view, see: Greatest Architects (1400-2000). American Architecture has enjoyed a complex but inspiring history, and - through firms like Skidmore, Owings and Merrill - continues to lead the world in advanced Skyscraper Architecture, although today only four of the twenty-five highest buildings in the world are actually located in America. From the early colonial style (1600-1720), architectural design in America followed Georgian (c.1700-1770) and then the Federal style of Neoclassical Architecture (c.1776-1920) and revivalist Greek Architecture followed by 19th century Gothic Revival Architecture (c.1800-1900) - including "Carpenter's Gothic" - Beaux-Arts Renaissance Architecture (c.1850-80), the Second Empire style (c.1855-80), and various forms of domestic architecture including Frank Lloyd Wright's Prairie School and so-called Frontier style (c.1850-90s). Since 1850, however, building design in the United States has been dominated by skyscraper architecture - now the most visible form of American art of the modern era. The first really supertall buildings were designed and engineered by the Chicago School, led by William Le Baron Jenney (1832-1907), Daniel Hudson Burnham (1846-1912), Dankmar Adler (1844-1900) and Louis Sullivan (1856-1924). Today, Chicago still competes with New York to be the home of the tallest building in America. After the Art Deco movement (c.1920-40), as a result of the exodus of artists and architects from Europe to America in the lead-up to World War II, including Bauhaus designers such as Walter Gropius (1883-1969) and Mies van der Rohe (1886-1969), the Modernist school became the pre-eminent architectural movement. Its purist variant, the International Style of modern architecture, championed by American designers like George Howe (1886-1955) and William Lescaze (1896-1969), as well as Europeans like Gropius and Mies, led to the minimalism idiom known as 'corporate modernism', and the more interesting 'decorative formalism'. However, only since the advent of postmodernist architecture (a spin-off from Postmodernist Art) in the 1970s, has architecture become re-humanized, by the introduction of new styles, historical content, and building techniques. The most famous variant of postmodernist architectural design is undoubtedly Deconstructivism (1980s onwards), championed by Frank O. Gehry and others. Meanwhile, skyscraper design has continued to develop, thanks to innovative architects like the Bangladesh-born Fazlur Rahman Khan (1929-82), a partner in Skidmore, Owings & Merrill, who was the highly influential inventor of tubular designs for skyscrapers, like the John Hancock Center, Chicago (1970), the Willis Tower (formerly the Sears Tower) Chicago (1974) and several other landmark buildings. With Harrison, worked on major projects like United Nations Building. With Sullivan, designed the Wainwright Building (St. Louis) (1892-3). With Delano, designed John D. Rockefeller House, NY (1908). Responsible for the world famous Art Deco Chrysler Building, NY (1929). Noted for Italian Renaissance villa and oriental styles of architecture. Designer of the marble and white limestone Lincoln Memorial (19151922). Pioneer of cast iron and architectural ironwork. Compare Gustave Eiffel (1832-1923), architect of the famous wrought-iron Eiffel Tower (1887-89) in Paris. Chicago architect noted for the brick and granite Pullman Building (1883). Boston exponent of Georgian, Federal and Greek architecture. Skyscraper designer; built the Harper Brothers Building (NYC) (1854). Bauhaus partner of Gropius; designed Whitney Museum of American Art. Gothic Revival architect, responsible for Museum of Fine Arts, Boston. Architect noted for his Gothic designs for college buildings. Designed elaborate interiors and woodwork; see Gunston Hall, Lorton, Virginia. First American-born architect; designed Massachusetts State House (1795-7). Chicago School architect; designed Montauk Block and other skyscrapers. Specialist in Beaux-Arts architecture; see Standard Oil Building, NY. Famous for personal approach to Romanesque and Gothic architecture. American historian of urban and architectural history. Partner in Shepley, Rutan and Coolidge. Designed Stanford University. Hugely influential French modernist, minimalist-style architect. 20th-Century architect in the Gothic Revival style. Neoclassicist architect, designed Indianapolis Public Library. Specialized in Greek, Gothic Revival and Egyptian architecture. Leading exponent of the Greek-temple house design: see the Bowers House. With Aldrich, responsible for Walters Art Gallery, Baltimore (1910). Architectural critic and theorist; favoured a return to Medieval Gothic Revival. Worked with Ray Kaiser Eames and Eero Saarinen in furniture design and film. Specialist in American movie theater architecture. Exponent of structuralism and Gothic Revival architecture. One of the famous "New York Five"; designed the Wexner Center, Columbus. With Purcell, produced small banks, Prairie School and Arts and Crafts houses. Beaux-Arts architect; noted for US Naval Academy, Annapolis (1896-1908). Experimental architect, designed geodesic domes. Famous for Gothic design of Pennsylvania Academy of Fine Arts (1872-76). Foremost Greek Revival architect in the city of New Orleans. Theater designer, and specialist in streamlined industrial interiors. One of the leading postmodernist artists in 20th century building design in America, he is a pioneer of deconstructivist architecture. Skyscraper architect, designed Romanesque Tower Building at 50 Broadway. Beaux-Arts architect, designed the Minnesota (and Arkansas) State Capitol. Noted for the Equitable Life Assurance Building (NYC) (1868-70). Specialized in domestic architecture in late Prairie School style. Partner of Ralph Adams Cram, late exponent of Gothic architecture. Postmodernist architect, designed Portland Public Service Building, Oregon. Draftsperson for Frank Lloyd Wright, famous for interior design. Colleague of Frank Lloyd Wright; champion of Prairie School architecture. Former head of Bauhaus design school. Emigrated to USA 1937. Specialized in large-scale shopping mall architecture. One of the "New York Five", advocates of European architectural modernism. Oversaw construction of US Capitol Building (1795-8). French architect who emigrated to America; was Pierre L'Enfant's draftsman. Specialized in major urban design projects, like Rockefeller Center (1933). Colonial architect noted for his Palladian designs. See: American Colonial art. Specialist in Beaux-Arts designs: see New York Public Library. 19th Century architect noted for his design of the Boreel Building (1879). First female graduate of MIT's architecture program (1890). One of the "New York Five": championed Bauhaus-style modernism. Curated the seminal 1932 MOMA Exhibition of Modern Architecture. Irish-American architect, designed the Georgian-style White House. Member of Chicago School, associate of William Le Baron Jenney. Designed landmark skyscrapers; Chicago Tribune Tower, McGraw-Hill Building. Neoclassical San Francisco architect, apprentice at McKim, Mead and White. With Lescaze, Championed the International Style of architecture in America. With Hood, designed neo-Gothic style Chicago Tribune Tower. Leading figure in 19th century architecture in America. Noted for Beaux-Arts designs, early skyscrapers, Statue of Liberty plinth and Met Museum facade. Third US President; designed Monticello House and Virginia State Capitol. Landscape architect, famous for books on Modernism and Postmodernism. Key figure in 3-D modern art; designed Home Life Insurance Building (1885). Arguably the most influential figure in 20th-Century Architecture in America; designed Seagram Building with Mies Van der Rohe. Designed the Jayne Building (1849), an early skyscraper in Philadelphia. Specialized in industrial factory architecture; see Ford River Rouge Plant. See also photographs of the River Rouge Plant by Charles Sheeler (1883-1965). Partner in Skidmore, Owings & Merrill; invented tubular designs for towers. Influenced by Beaux-Arts, classical and Egyptian designs: see Yale Art Gallery. Skyscraper architect noted for Detroit's Book Tower and Eaton Tower (1927). Famous for his modernist design of the Film Guild Cinema, New York City. Skyscraper architect known for his twin office building at 111-115 Broadway. Author of publications on Greek Revival architecture; designed churches. Leading designer of movie theaters, New York, San Francisco. Introduced Greek neoclassicism and Gothic Revival to American architecture. Noted for Federal Style architecture and city planning. Introduced the International Style of architecture to the United States. Jewish-American postmodernist associated with deconstructivism. Noted for his Second Empire architecture; see Philadelphia City Hall. Specialist in ornamental woodwork and traditional folk art. Partner in McKim, Mead and White; designed Boston Public Library (1887-95). Partner in firm of neoclassical architects; designed Rhode Island State Capitol. Postmodernist architect of the "New York Five"; designed Getty Centre, LA. German-born architect, combined expressionism and functionalism. Partner in Skidmore, Owings & Merrill; designed Lever House. Leader of Second Chicago School of architecture; designed Seagram Building. Architect of the obelisk known as The Washington Monument (designed 1838). Noted for Second Empire buildings, like the Old Post Office St Louis, Missouri. Pioneer of International Style of architecture: see, Lovell House, LA (1929). Introduced Italianate style of architecture. Noted for curvilinear designs; see parabolic arches at Raleigh sports arena. Leading landscape architect in the United States. 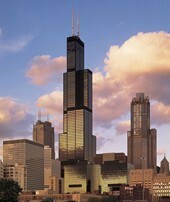 Partner in Skidmore, Owings & Merrill; designed Sears Tower, Chicago. Neoclassical architect, associated with Bulfinch and others. Prolific and influential Boston architect; see Groton School (1886-1901). Noted for his stylish contributions to urban public art, he is a modern architect best known for his Louvre glass pyramid, and John F Kennedy Library. Neoclassical designer, noted for his lighthouse architecture. Designed leading skyscrapers and movie theaters in San Francisco (1920s). Pioneer skyscraper architect, designed an 8-story building for 241 Broadway. Designed Jefferson Memorial, and National Gallery of Art, Washington DC. Architect of many early skyscrapers like Havemeyer Building (NYC) (1891-2). Upjohn pupil, Designer of Alumni Hall, Union College, Schenectady (1858-75). Treasury Department architect, also designed collegiate buildings. Designed shingle-style houses that influenced Frank Lloyd Wright and others. Worked with Louis Sullivan; associated with Arts and Crafts, Prairie School. With Venturi, designed the Museum of Contemporary Art, San Diego (1996). Specialized in railroad station architecture, like Grand Central Terminal, NY. Famous for the Gothic style design of St Patrick's Cathedral, NY (1858-79). Noted for Romanesque designs, like the Allegheny County Court House & Jail. Architect for the Park Row Building (15 Park Row), New York City (1901). Member of Chicago School of skyscraper architecture. Pioneers of suspension bridge architecture and engineering designs. Noted for hotel architecture. Also was supervising architect of the Treasury. Partner in Burnham and Root, skyscraper architects: see The Rookery (1887). Brutalist architect; designed Yale Art & Architecture Building (1958-63). Partner in Shepley, Rutan and Coolidge. Designed Ames Building, Boston. One of the top modernist architects; see TWA Flight Center, Kennedy Airport. Designed International Style houses; noted for Cubistic designs. With Venturi, designed Guild House Retirement Home, Philadelphia (1961-66). Specialized in urban design and housing architecture. Architect of fashionable midwest houses, using English Revival architecture. Partner in Shepley, Rutan and Coolidge. Designed Art Institute of Chicago. Chicago School landscape architect, founder of Holabird, Simonds & Roche. Partner in Skidmore, Owings & Merrill; world-famous tower architects. Designer of public buildings, schools, asylums and churches. Neoclassical architect, helped to design the Library of Congress. With Peabody, ran prestigious firm of Boston architects. Advocate of garden cities and planned housing. Designed over 100 railway stations, including Grand Central Terminal, NY. International Style architect; designed Museum of Modern Art (MOMA) (1939). Neoclassicist who designed the US Mint, Philadelphia (1829-33). Designed several halls at Yale University (1869-85). With Adler, produced the design for the Guaranty Building (Buffalo) (1894). Designed neoclassical US Capitol building, Washington DC. Leading Greek Revival and Gothic architect. Also noted for bridge design. Noted for his red sandstone church architecture; Trinity Church (1839-46) NY. Landscape architect; with Olmsted, designed Central Park, NY (1858-76). Founder of Venturi, Rauch & Scott-Brown, influential postmodernist architects. One of the leading neoclassical followers of Benjamin Latrobe. Exponent of "collegiate Gothic architecture" (1832-1903). Famous for hotel architecture and railroad building designs. With Warren, designed Biltmore Hotel, New York Yacht Club. Partner in McKim, Mead and White; designed Columbia University, New York. Noted for the National Academy of Design, NYC, (1863-65) in Venetian Gothic. Leading contributor to Victorian architecture, mostly associated with High Victorian and Gothic Revival designs. Pioneer of Prairie School and Organic architecture, precast concrete houses. One of the foremost figures in the history of art and crafts. Leading designer of supertall skyscrapes like World Trade Center. Designer of neoclassical and Italianate public buildings.  For more about architects in the United States, see: Homepage.